« So that was 2012…. In a couple of posts some while ago (here and here) I mentioned that included in the latest news on the refits was the suggestion that the Oasis Pools on Azura and Ventura would be uncoupled from the Retreat on both those ships. The Retreat is an extra-cost facility, and on Azura has included access to the Oasis pool. Ventura does’t yet have a Retreat – it will be added during her refit this coming spring. I was pleased when I read this: I’m not a fan of the Retreat concept at all, and anything that leaves public areas open to all passengers is to be applauded. 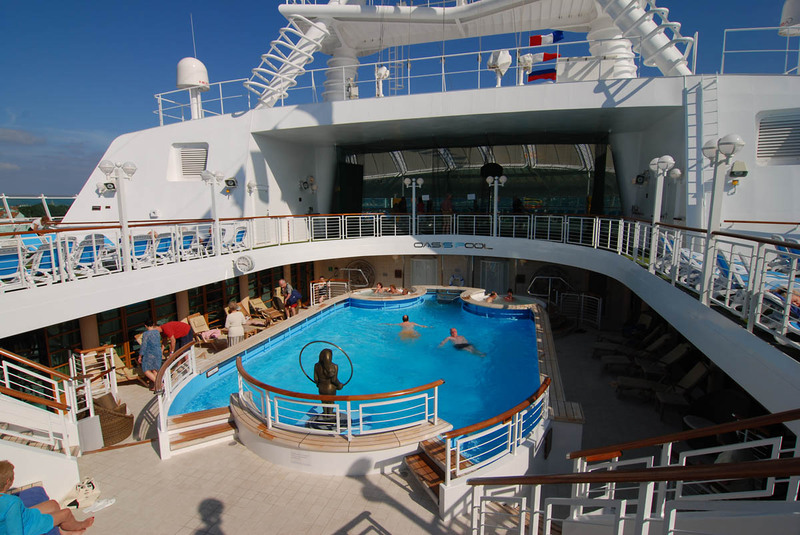 However there was a comment on another forum to the effect that in recent months the Oasis pool on Azura has been separately chargeable from, and at lower rate than, the Retreat, and it was suggested that what was meant was that it would be possible to use the pools separately from the Retreats, but that they would still be chargeable. So that’s pretty clear: these pools will be adults-only, and there will be no charge to use them. Hooray!